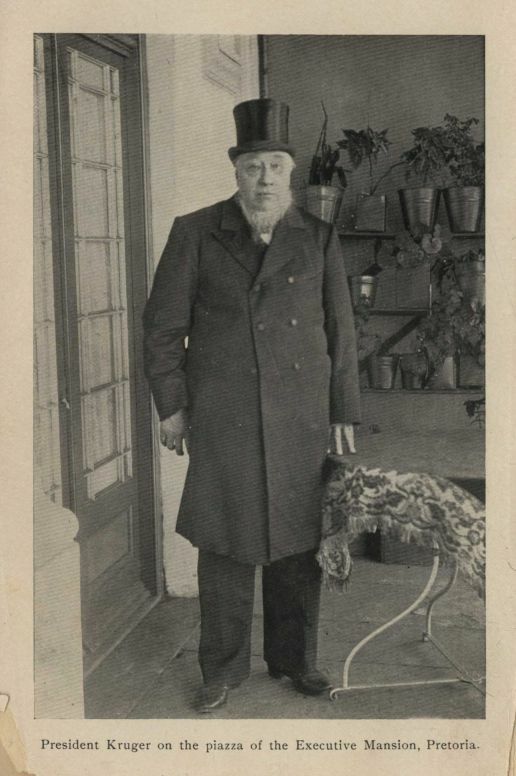 Posted by Jenny in Boer War, history, military history. Colonel Baden-Powell on the lookout. The day after the siege was lifted, the Mafeking garrison turned out for a memorial service at the cemetery. They stood at attention in a hollow square formation as a preacher slowly read the names of those slain in the defense. Three volleys were fired over the graves, the buglers played the “Last Post,” and everyone sang the national anthem. Colonel Baden-Powell dismissed the remnants of his force, passing them in review and addressing them with a few words of thanks. 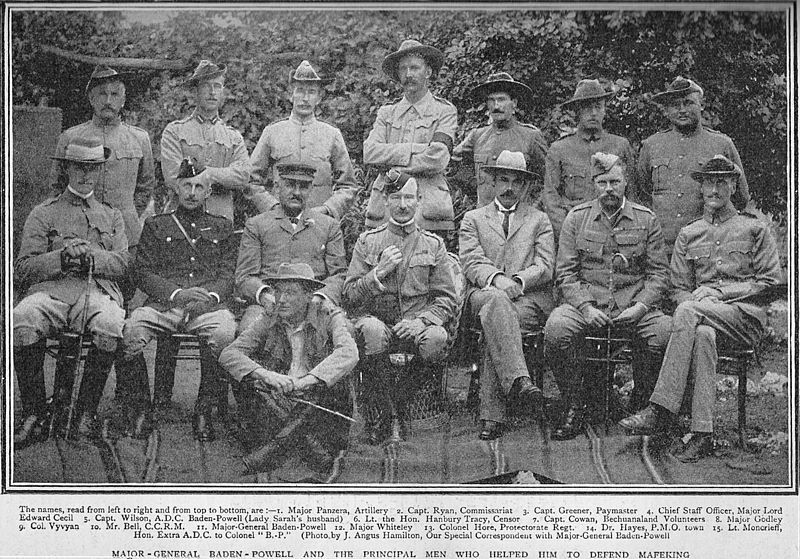 That afternoon Colonel Plumer’s column departed to repair the rail line to Bulawayo before heading off to see action in the eastern Transvaal. Colonel Mahon’s column remained in town another week, then moved south to join the massive army of Field-Marshall Lord Roberts as it crossed the Vaal and approached Johannesburg and Pretoria. Far away from this small town on the edge of the Kalahari, celebrations burst out in all parts of the Empire. 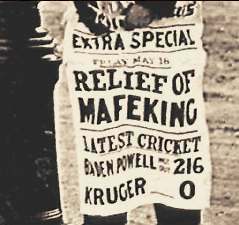 “MAFEKING RELIEVED” blared the headlines. Parades, fireworks, commotion: the public rejoiced so enthusiastically that a new word was coined to describe the exuberance—“mafficking.” The reaction was much more intense than what followed the relief of Ladysmith and Kimberley back in February. Why the mass hysteria? Two reasons stand out. First of all, the British public had a suitable hero to worship—B-P. Second, the war was finally going the way folks in England had expected. The army of Lord Roberts stood nearly on the doorstep of Pretoria, having marched inexorably across the Orange Free State. With the capture of the Transvaal capital, surely the war would be over quite soon. 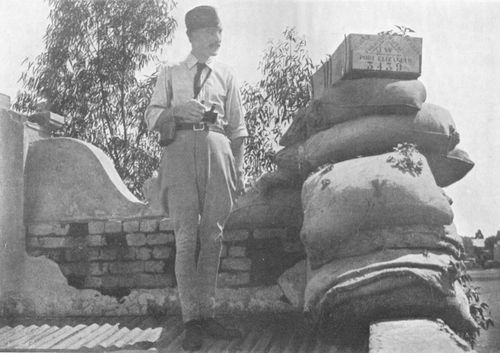 War correspondents at their “bombproof” in Mafeking. Hamilton’s dog, pictured here at right, was named “Mafeking.” He was wounded three times but survived the siege. And yet this was a man of peculiar talents. He could draw caricatures simultaneously with left hand and right, sing comic songs, and appear on stage in a wig and a girl’s dress. 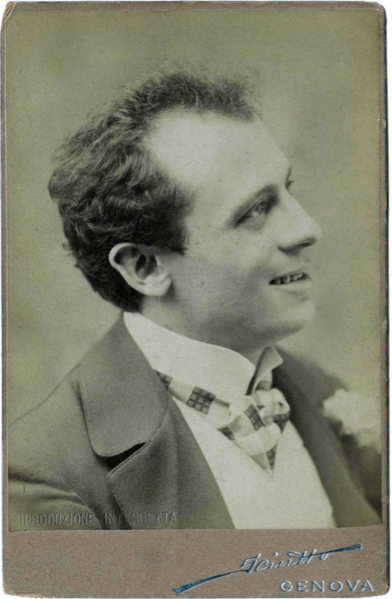 Lady Sarah Wilson observed that in the theatricals B-P assumed different roles with “Fregoli-like rapidity.” She was referring to the Italian actor Leopoldo Fregoli, who had entertained London audiences on an 1897 tour with his quick-change act, exiting stage left as a street musician and reappearing moments later as a woman stage right. But if the town alarm bells happened to ring during such a performance, B-P instantly put aside the masquerade and calmly took charge. Quite an interesting personality: full of earnest patriotic fervor one moment and indulging in whimsy the next. Whatever his contradictions, the important thing for the British public was that B-P had held the town during those long, hard days. The Empire entered the war October 1899 thinking it would be over by Christmas. But the ragged Boers, with their unkempt beards and dirty hats, proved a tougher foe than expected. They used their deadly Mauser rifles to win a major victory at Ladysmith, and in mid-December the British suffered the crushing Black Week defeats at Stormberg, Magersfontein, and Colenso. The picture stayed grim in early 1900. General Sir Redvers Buller experienced so many setbacks along the Tugela River that he became known as “Sir Reverse.” But shipload after shipload of fresh troops poured into Cape Town and Durban, and Piet Cronje’s February 27 defeat at Paardeberg marked a changing of the tide. Lord Roberts’ huge army of 30,000 pushed aside the outnumbered commandos that opposed it, steamrolling northeast to capture the Free State capital of Bloemfontein and press on toward Pretoria. 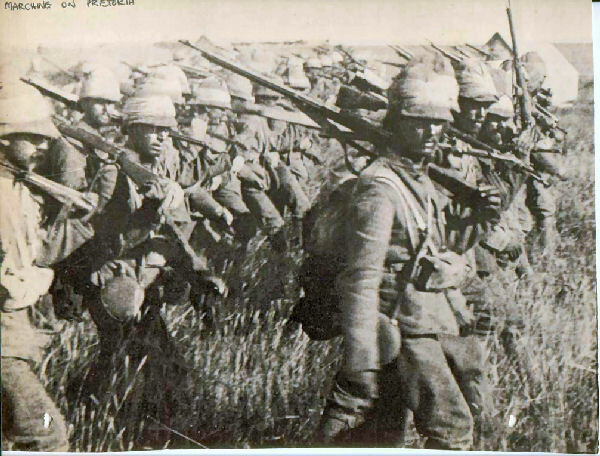 The Tommies marching on Pretoria. The relief of Mafeking came just two weeks before Roberts captured Johannesburg. Six days later the British flag flew over Pretoria, Paul Kruger and his Government officials fled in a railcar, and it seemed victory had been achieved. Many of the war correspondents went home, never suspecting the war could continue until May 1902. Two years of guerilla warfare lay ahead. General Lord Kitchener came in to wage war with scorched-earth tactics, burning down the Boer farms, forcing the commandos against barbed-wire fences in gigantic “drives,” and putting the women and children into concentration camps. When the Boers finally surrendered, they were wearing grainbags for clothing and subsisting on game and handfuls of plundered corn. 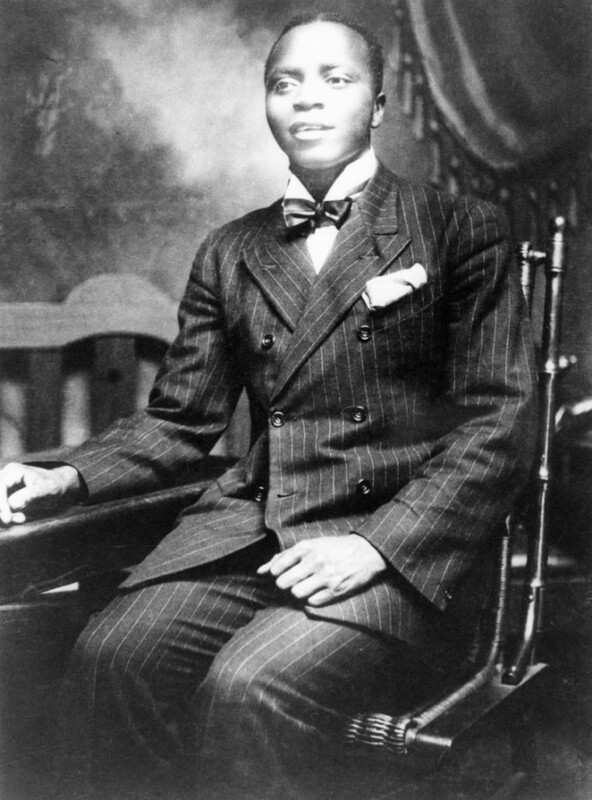 The adroit young African Sol Plaatje stopped keeping his diary at the end of March, too busy with his work as a court interpreter and freelancing work he did for the British newspapermen—he had access to information unavailable to the white community. When the siege ended, town officials paid tribute to the residents of the Stadt. The blacks had contributed much to Mafeking’s defense, in organized units such as the “Black Watch” and more informally, as when they prevented Sarel Eloff’s men from escaping through the Stadt. The Africans who’d arrived at the Stadt as refugees to live alongside the resident Baralongs were promised their own farm as a reward, and all were promised protection from the Boers.# But British authorities disarmed them after the siege. The blacks therefore found themselves defenseless against a raid in January 1902, when a party of Boers carried off all their livestock. Meanwhile, the promised farm never materialized. Mafeking’s Civil Commissioner, Charles Bell, commended Plaatje as “a faithful interpreter” and praised the reports he drew up on “the Native situation.” This emboldened Plaatje to ask for a raise, and he did receive a small increase in salary. In December 1900 Plaatje went to Cape Town to take a civil service exam, but his ultimate ambitions lay higher. He started a bilingual newspaper, The Bechuana Gazette, aimed at advancing black interests. He became a prominent spokesman for African opinion and went on in 1912 to become the first secretary of the South African National Congress, forerunner of the ANC. But his hopes of equality for blacks were never realized before he died in 1932. His diary of the siege, contained in a dilapidated leather scrapbook, was given by his grandson to a researcher named John Comaroff in 1969 and first published in 1973. *Angus Hamilton, The Siege of Mafeking. London: Methuen & Co., 1900. #A discussion of Plaatje’s later life can be found in Sol T. Plaatje, Mafeking Diary: A Black Man’s View of a White Man’s War. Edited by John Comaroff with Brian Willan and Andrew Reed. Cambridge, UK: Meridor Books, 1990. 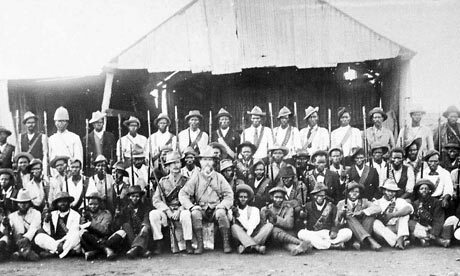 Black soldiers at Mafeking. As food ran short, blacks and whites had unequal rations. 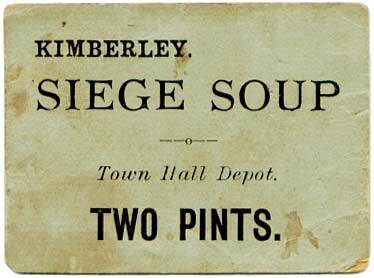 The three towns besieged from the first days of the war—Kimberley, Ladysmith, and Mafeking—faced very different challenges. Kimberley was the diamond-mining town, and Cecil Rhodes himself figured among the besieged population of 50,000 total, 10,000 of them black mineworkers confined in big compounds for the duration of their contracts. These fenced, guarded barracks were rationalized as a means to prevent theft of diamonds. For an interesting discussion of the subject, go here. The white townspeople were able to subsist on dwindling rations of bread and questionable meat supplemented by vegetables grown in home gardens. The “mine boys” had no gardens. They made do with less than a pound of rationed mealies (corn and corn meal) per day. Many suffered from scurvy, and mortality ran high. Ladysmith, having figured in critical action before the siege, had 14,000 troops in tent camps or dug into dog holes around the perimeter. 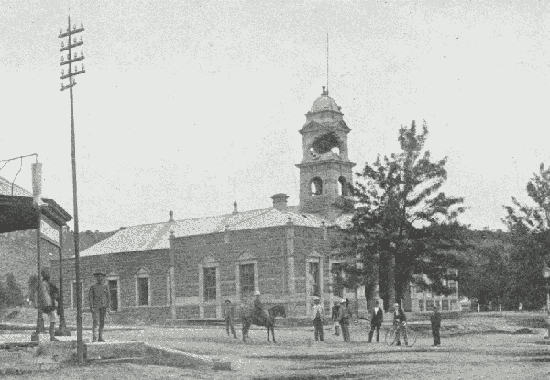 In town resided 3,000 white civilians and 2,400 black servants and workers who’d failed to get away in the two days between General Sir George White’s crushing defeat by the Boers and the start of the siege. Shell damage to Ladysmith town hall. Vegetables were scarce, but at least the supply of meat and bread remained adequate, especially after the painful decision was made to sacrifice the mounts of the cavalry brigade. This was supplemented by tough, chewy portions of “T.O.”—trek oxen. As it turned out, food was less of a problem for Ladysmith than typhoid and dysentery. By contrast, Mafeking was a Twin City of sorts, an African settlement dating to the 1850s consisting of thatched-roof huts, paired with a white town established 1885, featuring the usual hotel, shops, church, and tin-roof bungalows. The population of the “native Stadt,” together with refugee mineworkers from the Rand gold mines, totaled 7,500 blacks, while the white townspeople plus the garrison of two regiments numbered 1,300. Residents of Mafeking would have fared better than those of Kimberley and Ladysmith were it not that the Mafeking siege ran until May 17, 1900, while Kimberley was relieved February 15 and Ladysmith February 28. News trickling in about the other siege towns only added to the frustrations of Mafeking residents as they festered those three long months from February to May. B-P’s handling of the food shortage became a matter of controversy among historians in recent times, although the private diary of Col. Vyvyan of his staff reportedly shows that B-P made adjustments to his policy when it was shown to him that it could have inhumane consequences. Yet certain aspects of that policy cannot be disputed. 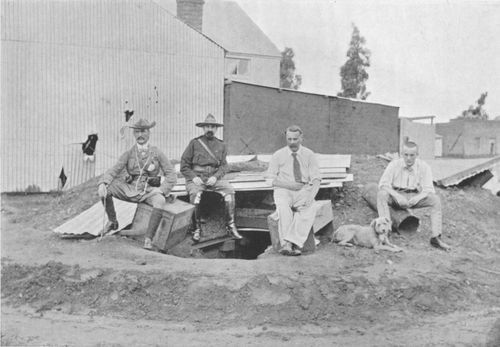 In a nutshell, the daily food ration for whites was more generous than the ration for blacks; the ration for horses was reduced so as to give horse food (oats) to blacks, while whites did not share in this plan; in the last months of the siege blacks were pushed out of town, running the gauntlet of hostile Boers, in order to reduce the number of mouths to feed; blacks suffered from starvation, particularly the refugee workers from the Rand gold mines who had arrived at the start of the war. In all this, it’s easy to pass judgment on the attitudes of the past. These attitudes are unacceptable to us today, but the simple reality was that neither the Boers nor the British of that time regarded blacks as equal to whites. I look at the diary of Sol Plaatje, an African with many unusual insights, to try to understand his attitude about the situation. In his entry for January 13, he wrote, “The following shows that there is a very great difference between black and white even in a besieged town. ‘Fresh meat rations to be reduced to 3/4 lbs. from Monday inclusive.’ It is a notice by Capt. Ryan…to the townites [the white civilian residents].” The implication is that blacks received smaller or no portions of meat. But we see from Plaatje’s description that the “natives” were quite willing to eat even the ears of horses when they were starving. How long could this go on? The Mafeking residents anxiously followed every scrap of news about the approach of the relief column, part of the army of Lord Roberts that had been advancing northeastward for months—slowed down by fighting major battles such as at Magersfontein. And before that could happen, the Boers decided at last to make an attack on the town. * Sol Plaatje, Mafeking Diary: A Black Man’s View of a White Man’s War. Edited by John Comaroff with Brian Willan and Andrew Reed. Cambridge, UK: Meridor Books, 1990. # Lady Sarah Wilson, South African Memories. London: Edward Arnold, 1909. 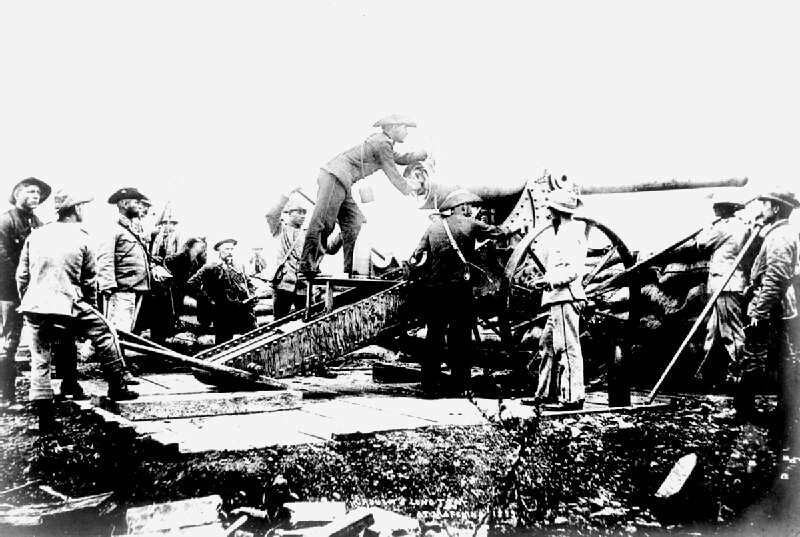 Boers with “Long Tom” siege gun at Mafeking. “Bring out the big guns” is a hackneyed expression. But that is exactly what the Boers did when the war began. They had four of them, 155-mm Creusot guns that lofted 96-lb. shells over distances of up to 11,000 yards (more than six miles). Paul Kruger had acquired them at the time he built four forts around Pretoria to defend the Transvaal capital. His citizens scratched their heads over the costly construction of forts at Despoort, Klapperkop, Schanzkop, and Wonderboomport. The forts turned out useless to keep the British from occupying Pretoria, but the guns did much damage wherever they traveled, pulled across the veld by long teams of oxen. Three of them went to the siege towns of Mafeking, Kimberley, and Ladysmith. Long Tom on its way to Kimberley. Once Baden-Powell rejected Cronje’s call for surrender, the Boers got the Long Tom at Mafeking into position and started hammering the town. Soon a routine was established. A lookout would observe through binoculars as the Boers moved the gun’s barrel into position. An alarm was telephoned to the quarter of town toward which the barrel pointed. Folks scurried into their “bombproofs” and waited for the thunderous sound. The shells knocked down walls and of course killed people, though there were many miraculous escapes. The British residents took to calling the gun “Creechy” or “Big Ben.” Sol Plaatje dubbed it “Au Sanna” and joked about the gun’s parting shot each evening at 9:00, calling it the “Bad night shot.” The Boers had many other smaller pieces of artillery, but it was “Creechy” that really grabbed the attention. In the meantime B-P tried what he called “kicks at the Boers,” sending out raiding parties to attack points along the Boer lines. He did this October 27, November 3, and November 7. Both sides suffered casualties, but nothing conclusive resulted. The two sides set ground rules for the siege. There was to be no fighting on Sundays. Certain places were declared off-limits, such as the women’s camp and the convent in town, as well as the ambulances. B-P and Cronje disputed these points from time to time, for instance when Cronje claimed a Maxim had been fired from inside the convent. Many of the Boers were strict Calvinists, regarding non-religious activities on Sundays as an abomination. The British, on the other hand, thought Sundays were a fine time not only for church but for leisure pursuits. A siege edition of the “Mafeking Mail” started up, announcing events such as a Sunday “Cycle Sports” competition on the Recreation Grounds. Prizes were distributed, including a clock, a handpainted fan, and amber cigarette holders. Among the events were a three-lap race (walk, then run, then cycle) and a half-mile bicycle race in fancy costume. African boys started collecting the unexploded “dud” shells that sometimes landed in town and selling them as souvenirs. Prices ranged from ten shillings sixpence for a one-pounder Maxim shell to six pounds for a Creechy/Au Sanna shell. The first weeks passed with some excitement, but life soon became a grind.